Tsuyama (津山市, Tsuyama-shi) is a city in Okayama Prefecture, Japan. As of 2017, the city had an estimated population of 102,294 and a population density of 200 persons per km². The total area was 185.73 km². The area increased in 2005 as the result of a merger with adjacent towns, which also boosted the city's population to more than 100,000. The city was founded on February 11, 1929. Tsuyama is known for the 17th century Tsuyama Castle, whose grandeur was said to rival that of Himeji Castle in neighboring Hyōgo Prefecture. The castle was destroyed in 1874, and today only the stone foundations remain, save for a single turret that was reconstructed in 2005. The castle ruins remain Tsuyama's main tourist attraction along with Joto Street, a narrow street of old, traditional buildings that was once part of the pilgrimage route from Kyoto to Izumo, and Shurakuen Garden, a traditional Japanese garden constructed in 1657. The 1938 Tsuyama massacre, in which 21-year-old Mutsuo Toi murdered 30 people in the course of one and a half hours, took place in a village near Tsuyama which became part of the city of Tsuyama in 2005. It was considered for several decades to be the world's largest massacre committed by a single criminal. On February 28, 2005, the town of Kamo, the village of Aba (both from Tomata District), the town of Shōboku (from Katsuta District), and the town of Kume (from Kume District) were merged into Tsuyama. 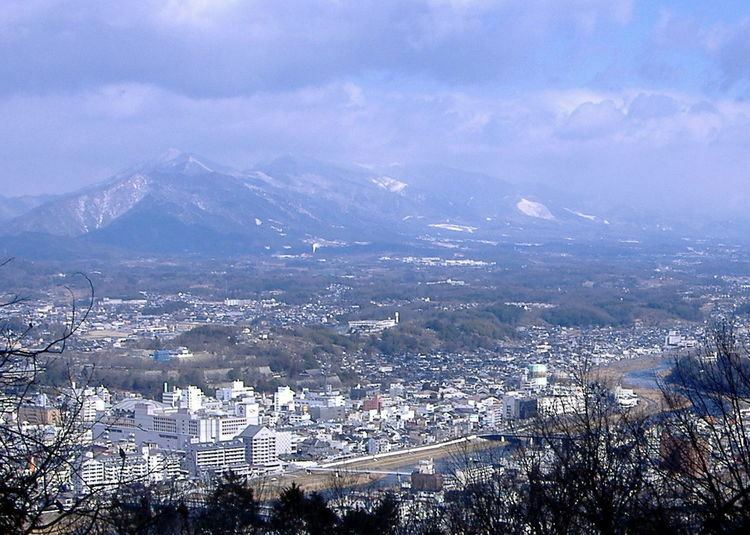 Tsuyama has a humid subtropical climate (Köppen climate classification Cfa) with very warm summers and cold winters. Precipitation is significant throughout the year, but is somewhat lower in winter. 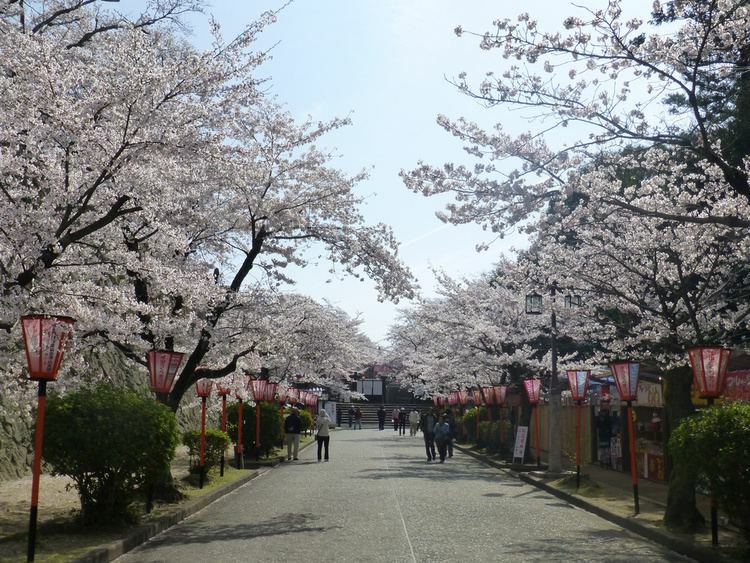 Cherry Blossom Festival (early April) - This event is held in Kakuzan Park where around 5000 cherry blossom trees attract people from all over western Japan. Many picnickers arrive before dawn and set down blue tarps and then remain until dusk, grilling out and drinking sake. Gongo Festival (First Saturday and Sunday of August) - The Gongo, or Kappa, is a fictitious animal said to live in rivers. The festival is based around the legend that the Gongo can be seen in the Yoshii River in summer. Local people congregate on the banks of the river wearing traditional Japanese clothing and eat and drink at the many temporary stalls set up there. The festival culminates in a spectacular firework display on the Sunday evening. Tsuyama Autumn Festival (Mid to late October) - Many people parade through the town pulling danjiri. Lion Dance Festival (October 17) - The Lion Dance Festival, held at Takata Shrine, began around 710 A.D. to thank the gods for a good harvest. A male and female lion, each controlled by twelve dancers, perform a soul-stirring dance imitating a struggle. The lions keep time with a flute and drum. The dance is believed to drive away the devil and impurity. Old Izumo Street Festival (Beginnining of November on Sunday) - A festival on Joto Street during which they wear traditional clothes and open a theater, tea houses, and various stalls. Tsuyama's main railway station is Tsuyama Station. The station is served by the Tsuyama Line (to Okayama), the Kishin Line (to Himeji and Niimi), and the Imbi Line (to Tottori). All services are operated by JR West. Tsuyama is one of the major cities along the Chūgoku Expressway. As with many Japanese cities, cycling is a very common form of transport, particularly among school students. The nearest airport is Okayama Airport.